The 2019 World Superyacht Awards social programme gives guests the opportunity to experience the Golden Age of Travel for a day on board the iconic Belmond British Pullman. Sister train to the Venice-Simplon Orient Express, you’ll tour through the beautiful Kent countryside whilst enjoying a decadent a 5 course lunch. 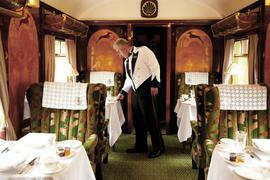 The Belmond British Pullman embodies everything that was fabulous about the roaring 20s and 30s. Today, each carriage has been lovingly restored and refurbished so that you can experience the glamour of vintage rail travel. Each carriage holds unique treasures and a wealth of original features including intricate marquetry and art deco designs. Ticket price per guest: £225 + VAT per person.